The Small Barn01362 684206work Self-cateringThis cosy barn conversion is part of the old farmstead of Severals Grange situated just north of the village of Wood Norton, 8 miles south of Holt. It is ideally placed amongst the abundant holiday attractions of Norfolk from Sandringham to the west , the Norfolk broads to the east and the beautiful north Norfolk coast just 20 minutes drive away. The ground floor accomomodation comprises of a well fitted kitchen / diner, with a small lobby leading to a comfortably furnished living room with French windows opening onto private terrace and garden. An open plan staircase from the living room leads to the upper floor with 2 bedrooms (1 double, 1 twin) both with ample storage space and a shower room with shower cubicle, hand basin and W.C. 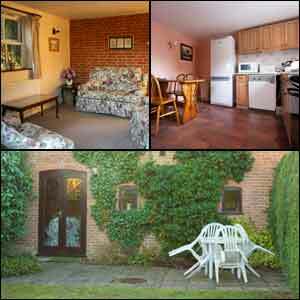 The cottage is carpeted throughout and has oil fired central heating. There are no extra charges for heating, electricity or linen but towels are not provided .No smoking. Plenty of off road parking is available and a shed for storing bikes. All visitors are most welcome to access the extensive gardens which used to the home of Hoecroft Plants, a famous nursery specialising in grasses and foliage plants and there is an abundance of wildlife to be seen in the grounds. Sleeps 4. Open all year. 2nd November - 13th April - £370 per week. The Small Barn offers weekly bookings starting on Saturday. This cosy barn conversion is part of the old farmstead of Severals Grange situated just north of the village of Wood Norton, 8 miles south of Holt. It is ideally placed amongst the abundant holiday attractions of Norfolk from Sandringham to the west , the Norfolk broads to the east and the beautiful north Norfolk coast just 20 minutes drive away. 2 miles north of Guist on B1110. Guist is 5 miles from Fakenham on main road to Norwich (A1067). 8 miles south of Holt on B1110.